I love gifting personalized book plates. Book plates may seem, I realize, old-fashioned, but I adore them. They celebrate reading and speak to a child's deep desire to mark things as their own. 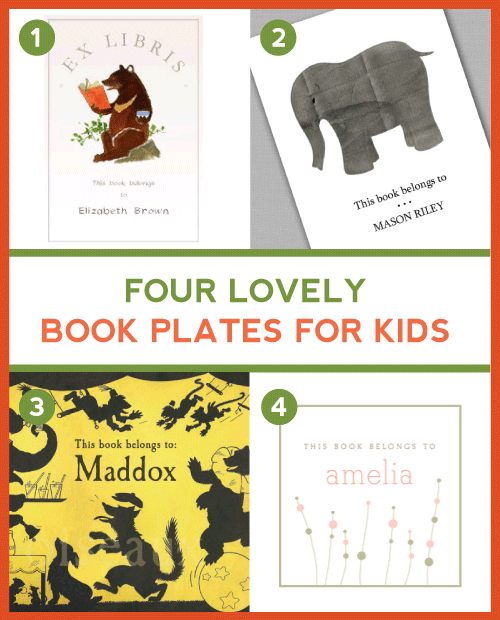 My children loved choosing which of their books deserved book plates, and to this day, when I happen upon their book plated copies of Goodnight Moon or Make Way for Ducklings, tears spring to my eyes when I remember their chubby toddler hands smoothing the stickers into the books. The crooked angle at which some of these plates are adhered reminds me of their fierce determination to "do it my own self!" 1. Felix Doolittle's book plates feature gorgeous, lush drawings and in many cases the traditional "ex libris" language. 2. Paper Crabb on Etsy offers a modern take on book plates with gorgeous, bold designs and a spare font. 3. Oiseaux on Etsy offers a wide range of vintage illustrations made into book plates. 4. 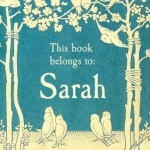 Blonde Designs offers small, square bookplates with simple, lovely designs. I especially like gifting personalized book plates with a favorite book or two. Choosing books for newborns or toddlers is always a balancing act; you want something classic and wonderful enough that it will be in their library a long time (and merit a book plate!) and yet not a well-known favorite that they surely have six copies of already. Some of the books I have given most often are Miss Rumphius and Roxaboxen by Barbara Cooney, Space Boy by Leo Landry, Zen Shorts by Jon Muth, and Mole Music by David McPhail. Image credits: all images are credited to referenced company. Image 1 thumbnail is by Oiseaux.